Mouth guards and helmets help protect little surfers mouths, heads and teeth! April is National Facial Protection Month. With spring sports in full swing, it’s a great time to remind ourselves of the importance of protecting our little surfers’ faces, mouths and heads. Getting a tooth knocked out can be traumatic and scary for kids and parents. Helmets and mouth guards can go a very long way in preventing oral and facial injuries. A mouth guard (or mouth protector) will cushion a blow to the face, minimizing the risk of damage to a child’s face and teeth. 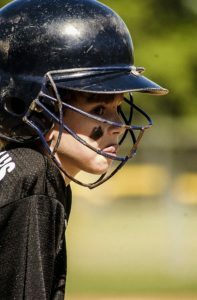 Children aged 7-11 are most vulnerable to mouth-related injuries from sports. Athletes who do not wear a mouth guard are 60% more likely to suffer damage to their teeth if they take a blow to the face. Knocked Out Tooth … Now What? If your child gets a tooth knocked out, don’t panic. If it is a primary or baby tooth, treatment is not usually necessary. Call your dentist during regular business hours to make an appointment so your pediatric dentist can take a look. A permanent tooth getting knocked out requires quick action. If you can, save the tooth. Hold it by the crown, not the root, and rinse it with milk or water. Don’t use soap. You want to handle the tooth very gently as the roots are especially fragile. Don’t wipe debris or dirt off the tooth with a shirt or cloth. If the tooth is not damaged or cracked, try to put it back in the original socket and hold it in place by biting on gauze. If you cannot get the tooth to sit inside the socket, or your little surfers is having trouble holding it, find a cup or covered container. Put the tooth in the container with the child’s own saliva or a little bit of milk. It’s important to keep the tooth moist. You will want to contact your dentist immediately to make an emergency appointment. The quicker and sooner you can get your child in for treatment, the greater chance you have of saving their tooth. When a tooth is knocked out (also known as an “avulsed tooth”), the nerves, blood vessels and supporting tissues become damaged. While they cannot be repaired, a dental procedure can reattach the root of the tooth to the bone. Chipped Tooth … is it an Emergency? Yes, a chipped or fractured tooth also requires immediate action. It’s important for your pediatric dentist to evaluate the extent of the damage to the child’s mouth and tooth. Without treatment, the tooth can become infected or further damaged. This could result in extensive dental treatment. Rinse your child’s mouth with water and be careful to save any chipped fragments of the tooth. Bring the pieces of tooth to your dental appointment. Facial Protection … It’s Worth It. The Smile Surfers team, along with the American Academy of Pediatric Dentistry and the Academy for Sports Dentistry, urge parents, coaches and athletes to consider the use of a mouth protector, guard and helmet. You may think non-contact sports pose no threat to oral and facial safety, but injuries can occur in any sport or activity. Book your appointment today with our Smile Surfers pediatric dentists. Two locations to serve you!